The beautiful city of Salisbury is steeped in history. Renowned for the largest Cathedral spire in the country, the ethereal beauty of Stonehenge and with stunning architecture. Homes of Salisbury and the surrounding areas are no exception, so whether you own a modern town house or a country manor, plantation shutters will be a stylish addition to your property. With many of the county’s residence’s having equal architectural beauty, you want to know that when making additions to your home the company and products you choose will be both sympathetic and perfect. Designed and tailor made to fit any style and shape of window and compliment your colour themes, plantation shutters will enhance the beauty of your home inside and out, adding that finishing touch of style and elegance. Your local shutter expert is Rob Cole (pictured). Rob is a specialist that listens and creates beautiful shutter solutions. Rob has earned an unsurpassed reputation for quality and service. Wooden plantation shutters have the added benefit of adding value to your home; expertly fitted, they will save precious energy keeping the cold out and heat in. Light is not compromised as your shutters can be adjusted so easily to reduce the glare of the sun harmful to your furniture and soft furnishings, which is why plantations shutters are the number one window dressing choice of interior designers. The team at Just Shutters have years of experience, knowledge and are proud of our strong reputation for providing the highest quality materials and service. We offer a lifetime guarantee and when fitting your beautiful shutters, we treat your home with respect and consideration. To find out more about our stunning shutters please download our brochure, request a home visit where our expert designer will visit you in person with samples you can view at your own windows, or call us for a quick and personal response: 01722 440714. Plantation shutters will be a beautiful addition to your home and with the experience of an established, family owned business to advise and provide you with a first class product and service at a competitive price, your investment will bring you pleasure for many years to come. 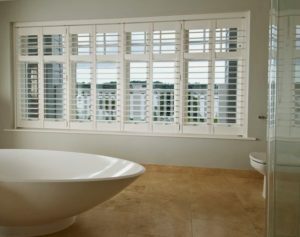 You may also like to see Shutters Chippenham. Call Just Shutters for consultation and advice on 01722 440714 or book your appointment online here.